Almost every webmaster knows about meta tags. There are different types of meta tags which are generally placed in the <head> section of the markup of a webpage. The objective of adding meta tags to a webpage depends upon the behavior or property of the tag we are adding – for example, meta description tag is used to add description to our page that appears in search engine results, meta charset is used to define the character encoding of our page and so on. I just came to know about meta revised tag when my friend Mrinmay told me about some sites making use of it (thanks to him for letting me know about this useful tag), and in fact, he was also using the tag on one of his websites. In this article, we’ll know the use of a rarely discussed meta tag, the meta revised tag. What is the function of meta revised tag? Meta revised tag is used to tell Search Engine bots (Google, Yahoo!, Bing etc.) the Last Modified Date and Time of any Webpage in which you have made certain changes. 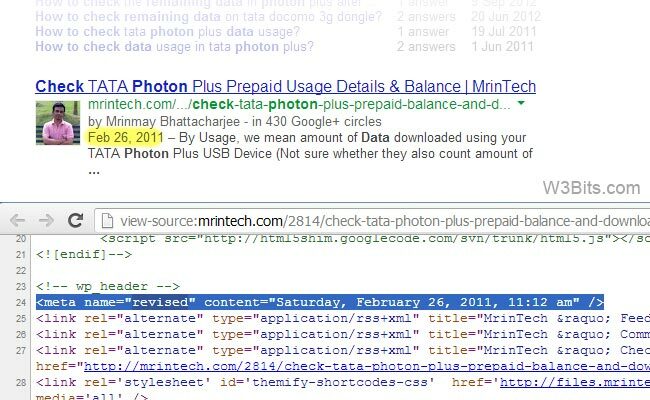 Web crawlers may decide to update their index by reading this tag info on a web page. The meta revised tag should only be provided with the last modified date (and time, optional) in it’s content parameter. The date can be in a numerical form separated by dashes (-)or slashes (/) or typical date (eg. Sunday, May 12, 2013). Crawlers have different ways to fetch the last modified date and time of a web page. It could be done through reading HTTP headers or by comparing the updated page and the old / cached copy of the page. So, if your site doesn’t have meta revised tag implemented in it, it doesn’t mean that your site won’t be crawled for search engine indexing. But crawlers not always perform checks to determine the last modified date of all the pages in it’s index. Here, the meta revised tag can play important role, as it provides a small last modified info to the crawler without needing the thorough comparisons to determine the same. So, if you want to keep the crawlers updated about your content, start using meta revised tag on your site’s posts and pages.